The Western Pacific was one of those underdog railroads that had a loyal following with railroad enthusiasts. The spectacular scenery, the California Zephyr, brightly painted locomotives and freight cars certainly caught many a fan's eye. This is a well-researched, high-quality book by author Jeff A. Asay. 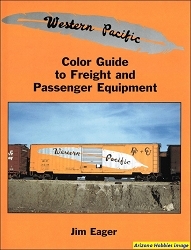 Jeff authored the Union Pacific in the Los Angeles Basin title for Signature Press. John Signor and Jonathan Signor helped with the maps and layout of this book. About 80 percent of the photographs are B&W as this is a history book using older photos with some later-day photographs in Color. You will not be disappointed in this book! 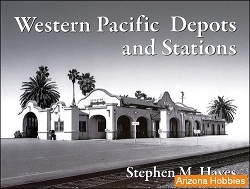 The Western Pacific Railroad, from its inception in 1903 until the Union Pacific takeover in late 1982, was always fending off one crisis or another, managing to remain independent through luck and clever financial maneuvering. George J. Gould, eldest son of Wall Street speculator Jay Gould, formed the WP to break Edward H. Harriman's railroad stranglehold at Salt Lake City and also to create a true transcontinental rail line. George was not up to the task and he lost control of the WP to banker Alvin Krech in 1916. Gould's WP from Salt Lake City to San Francisco was well built but expensive. His chief engineer, Virgil G. Bogue, did a masterful job locating the route and laying rails, but the final cost was much higher than anyone anticipated. Gould bankrupted the WP and the Denver & Rio Grande Railroad in the process and Krech seized them both. Krech made many improvements and additions but nearly pushed the WP into another costly bankruptcy. Wealthy investor Arthur Curtiss James rode to the rescue by taking control of the WP in 1926. James made the costly decision to build the Inside Gateway line from Keddie to Bieber, meeting up with the Great Northern. That and other WP projects, some successful and some not, ran WP into its second reorganization in 1936. James was long gone by the time WP found its way out of bankruptcy at the very end of World War II. More conservative management over the next twenty years kept the railroad in the black but it was always touch and go. A costly and tiresome fight against Southern Pacific's takeover bid in the early 1960s, followed by a lengthy effort to cut off the money-losing California Zephyr passenger train, weakened the WP to the point it was acquired by takeover specialist Howard Newman in 1970. Newman, aided by legendary operating executive Al Perlman, bolstered WP's finances, took it into a holding company, and then spun it off to a group of executives in 1978 headed by Mike Flannery. It was too late to save the railroad by then, and Union Pacific gathered it into its Missouri Pacific merger proceedings a year later. UP quickly brought the WP into compliance with modern railroad standards and it has served the larger company well. Today, much of the WP has been abandoned and some has been sold, but the original Bogue main line from the Bay Area to Salt Lake City remains intact and in operation. 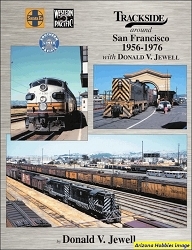 This book also relates the parallel story of the Sacramento Northern Railway, an electric interurban that Alvin Krech acquired for the WP in the 1920's for its freight traffic base. SN suffered the same precarious ride as its parent company and was finally merged into Union Pacific along with the WP. Bibliography and Index, pp. 506-512. Lockridge Press, hardcover with dust jacket, 512 pages, 9 x 12 x 2 in., B&W and Color photographs, maps and illustrations.